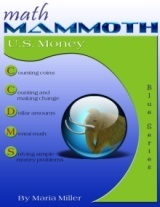 Math Mammoth U.S. Money - elementary math workbook about counting coins and money problems for grades 1, 2, and 3. Download and print. 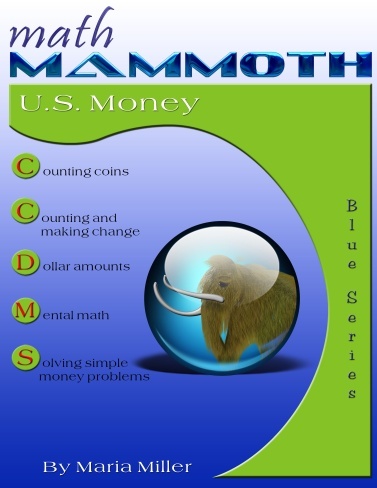 Math Mammoth U.S. Money is a worktext that covers U.S. money-related topics usually encountered during grades 1-3. The book contains both textbook explanations and exercises, and is designed to be easy to teach from, requiring very little teacher preparation (you do need to find some practice coins before the lessons). The book starts with first-grade topics such as counting pennies, nickels, dimes, and quarters. While the lessons use pictures for the coins, practicing with real coins is, of course, even better and you should have real money on hand to practice with. Math Mammoth Early Geometry—a worktext about basic shapes, geometric patterns, right angles, area, and perimeter (grades 1-3). Free counting money worksheets for grades 1-3 — generate worksheets for counting all common US coins and the smallest bills. Math Mammoth (Review) by Learning Curve blog. Math Mammoth Blue Series — review by Adventures with Jude blog, focusing on the book Math Mammoth Money. I did the first page of the money problems with her. How you explained when to use 1 quarter, 2 quarters etc was so EYE-OPENING for her! She had never had it explained that way and she was so excited!!! Math is her weakness and her body expressed so much joy as she got each one right!!!! I had real money that she picked up and worked with! I can't wait to do a similar page with her. 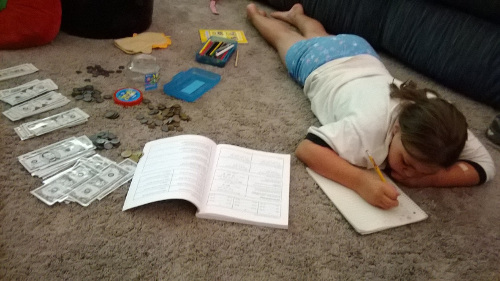 Right now we are really working on her understanding how to handle money as that is such a life skill. ... I did the math again with her today and she squealed with joy... something she hasn't done in a long time when it comes to math.